IAMGOLD takes a partnership model to its community relations approach. Through proactive communication, we engage directly with our host communities to help them maximize the benefits of mining at the local level. Whenever possible, we partner with governments and civil society to help deliver more effective and sustainable community development. This is exemplified by our 5-year, $7.4 million partnership with Plan Canada which leverages CIDA-funding to deliver training and education throughout Burkina Faso. We believe that our participatory approach gives us direct operational efficiencies. Better community relations means more focused and productive community meetings, more local purchasing, and more (and better) local employees. It also maintains our social license to operate, which opens doors for us around the world. But most important, it adds value to our stakeholders – from communities to investors to governments. It is important to distinguish and understand the various ways in which positive, neutral and negative impacts are made at the local, regional and national levels. Part of this clarity comes by distinguishing between the impacts made through our operations (local hiring, purchasing, investment in infrastructure, taxes paid, et cetera) and the impacts that can be made through voluntary initiatives. Our Sustainability Policy, in combination with our management frameworks and various other internal and external frameworks, provides the guidance on how to understand and manage both the positive and negative impacts. Each site uses a host of both corporate and site-specific tools to implement the management frameworks. A community relations handbook was developed in 2010 in collaboration with representatives across all sites for the purpose of guiding site-level practitioners through the many aspects of community engagement and development. The handbook utilizes best practices from the world’s mining- and community-relations leaders, and incorporates guidelines and standards set out by the International Finance Corporation (IFC), the International Council on Mining and Metals (ICMM), the Global Reporting Initiative (GRI), the Canadian Mining Association’s Towards Sustainable Mining (TSM) program, and the Voluntary Principles on Security and Human Rights. To accompany the handbook, the group of representatives has constructed a community relations audit protocol, which was piloted in 2011. 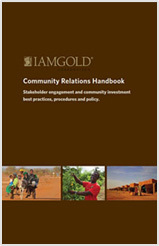 The tool helps set a strong IAMGOLD standard for community engagement and development. For more detailed information on our performance, see our most recent Annual HSS Report.